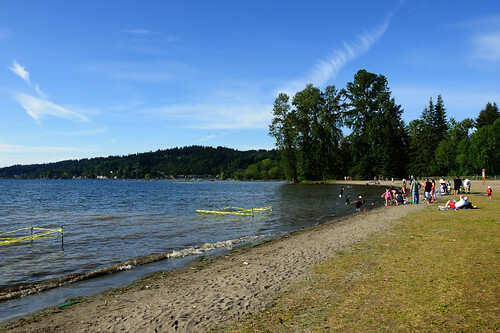 This is a view of the beach at Lake Sammamish in Issaquah, looking east. It's a really good spot on days with a north wind to practice ground-handling skills before heading over to Tiger Mountain. Conditions looked promising to fly on Wednesday, but ended up being just the opposite. After a long, dreary winter hiatus, I arrived at the landing zone in the afternoon hopeful for my first flight of the year, but it was not to be. Another pilot had just swooped down saying conditions were too dangerous. A bit of a bummer for me, naturally, but not unusual given the nature of our sport. The weather does whatever it wants, and doesn't care if I like it or not. Just because it's a nice sunny day with a perfect 5 mph wind doesn't mean it's safe. Sometimes you don't get any flying in at all, but spend all day on the slope or in the park parawaiting. At Tiger an east wind is dangerous because there's too much trashy air spilling over the mountain that can really cause you problems (death, for one) if you get caught in it. As a new pilot, I take it at face value when the old timers tell me not to fly. They've seen too many accidents caused by poor judgment to be ignored. Having made the decision not to unnecessarily risk my neck, I drove over to Lake Sammamish for some practice with the wing. I got in a few inflations, but the wind wasn't really blowing so I sat down in the sand and just enjoyed the view. It felt good to be alone, without any demands on me (including those from myself) and just appreciate time and place. For once I wasn't doing anything, but simply being. I feel grateful for the time to simply be close to nature (water, in particular) and recharge. It's really good for the human soul, and I recommend whatever version of it that works for you. I didn't get to fly, but just the fact that it was even possible lets me know I'm getting close. That thought alone is worth savoring, and one that came to me while reflecting at the lake. There is an inner voice, unique to every person, and the human spirit opens to it more easily when given the right conditions. In an environment of near constant activity and sense bombardment, it's the simple, peaceful and natural solution that works best. For those who don't know, this is ground-handling, also known as kiting. Everything happening to the wing is information that travels down the lines, into the pilot's hands, harness and mind, creating muscle memory and skills that we use when encountering similar conditions in the air. It's good practice for anticipating the wind and making the same subtle adjustments necessary to keep the wing centered and overhead when we're 5000 feet off the ground. Kiting is fun, sort of a sport within a sport, both meditative and good exercise, that allows me to interact with nature. Every day the wind is different and thus the dance is too. The inherent variety of conditions fosters learning and sensitivity to the elements. I like to think of it as taking my spirit for a walk.